Today I unexpectedly came across one of the cows from “Cows on Parade” on a balcony of the house at the NE corner of Clark and Dickens Streets in Lincoln Park. Are there any more of those cows still parading around Chicago? 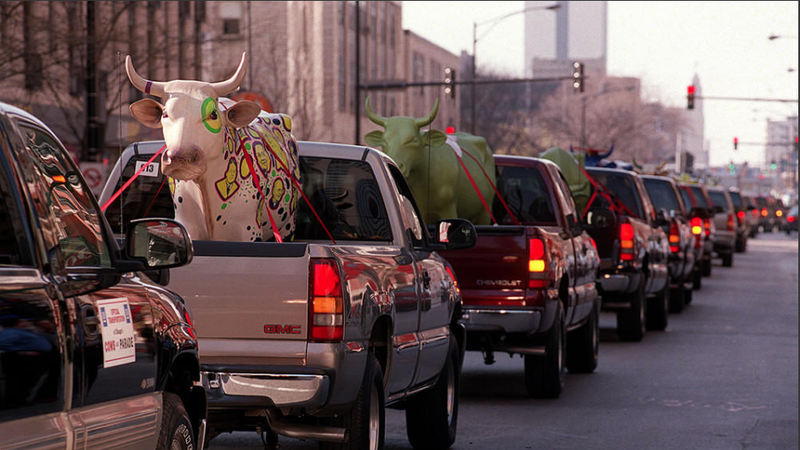 It’s hard to believe the Cows on Parade public art project was nearly 20 years ago! The display of decorated fiberglass cows took Chicago by storm the summer of 1999, with over 300, mostly along the Magnificent Mile, Museum Campus, and the Loop. Chicago shoe mogul Peter Hanig brought the idea to Chicago in 1998 after he saw a similar display in Zurich, Switzerland, a city famed for its dairy production. Hanig and legendary Chicago Cultural Affairs Commissioner Lois Weisberg lined up a herd of sponsors and artists. The Chicago cows were made by the same Swiss manufacturer, which is why they have horns. The Swiss don’t remove their cows’ horns as is commonly done here. The artists could choose from three poses – head up, head down, or lying down. They were paid $1,000 for their work dressing up the cows in a wild assortment of themes. After the show was over, most cows were auctioned off and the money went to the charity of the sponsor’s choice. The display’s tremendous popularity spawned copycow projects for the next 12 years across the U.S. and even the world as other cities put on their own cow displays. Like other cities, Chicago has hosted different objects since then, including horses, globes and fire hydrants. Most recently, the artistic animals on Chicago’s streets were not cows, but canines. Around 100 fiberglass German shepherds were sponsored to benefit the Police Memorial Foundation and PAWS Chicago. Chicagoans who miss the Cows on Parade can still milk the project for a little longer, though. Here’s a roundup of a few cows still on public display. • CTA Headquarters, 567 W. Lake St.
• Illinois Medical Society Building, 20 N. Michigan Ave.
And if that’s still not enough dairy air for you, check out this segment from WTTW’s series Artbeat Chicago about the 1999 display. There is an otherwise unremarkable three-story apartment building near Midway Airport with three large concrete plaques depicting monkeys that “Speak No Evil,” “Hear No Evil” and “See No Evil.” Why would anyone do this and who was it? The building in question at 5516 South Pulaski was built in 1955, according to county records, and it does sport three plaques on its façade with the three wise monkeys, embodying the proverbial admonition to see no evil, hear no evil and speak no evil. We spoke to local stone carver Walter Arnold, who said they’re not concrete but limestone carvings. He said that at the time they were made, there were a handful of stone mills around Chicago that could’ve made them, but the plaques are unsigned, so we can’t say for sure who it was. We also can’t say for sure why this set of monkeys is there, but we can say they’re not the only monkeys hanging out on buildings around Chicago! We spotted very similar monkeys on a three-flat at 4035 N. Sawyer in the Irving Park neighborhood. It was built in 1959. They’re not identical in design, but the monkeys are very similarly carved and the backgrounds share elements, like the sunburst, strappy leaves, and cobblestone pattern. The plaques are also aped on a larger scale on three 1957 buildings in suburban River Forest. We were able to find out a little bit more about these buildings. They were built by an Oak Park contractor named Angelo Esposito. While the architectural style among all three sets of buildings is similar, but we haven’t yet been able to confirm that Esposito’s company built them. However, he did say in that 1959 interview that his company had built similar buildings ornamented with sculpture, so it’s worth noting that there are carved limestone plaques on the buildings flanking the Sawyer building – a piper and a figure of the Greek god Hermes, and another carved limestone piper around the corner from the River Forest buildings at 1320 N. Harlem. If you’ve seen similar plaques around Chicago, we’d love to hear about it in comments section of this story! Note: This episode of “Ask Geoffrey” first aired on “Chicago Tonight” on March 28, 2018.